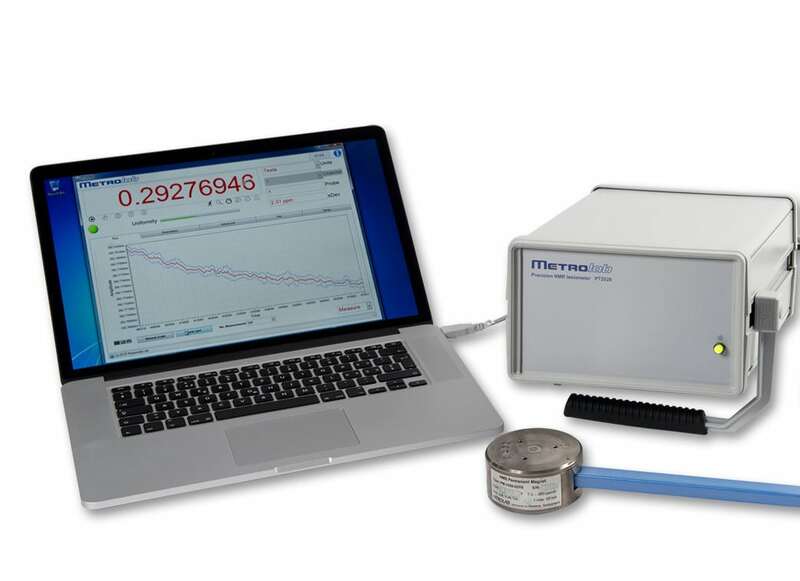 Metrolab is especially known for their precision NMR teslameters. These can also use EPR probes to measure low fields. In this section, we want to tell you a little more about these – our – technologies. If a nucleus has spin, it tends to align itself to an external magnetic field. However, by giving it exactly the right additional amount of energy, the nucleus can be induced to flip into the opposite spin state. Nuclear Magnetic Resonance (NMR) occurs when a radio-frequency field applied to a sample is just the right frequency – called the Larmor frequency – to induce this spin-flip. Electron Paramagnetic Resonance (EPR) is a similar effect, with an electron rather than a nucleus. It turns out that the energy difference between the aligned and counter-aligned nuclear states depends linearly on the field strength. Thus the ratio of the resonant frequency to field strength is a physical constant, called the gyromagnetic ratio (gamma). It is approximately 42.5 MHz/T for protons (hydrogen nuclei). Other nuclei also exhibit NMR, but with a different gamma, for example 6.5 MHz/T for deuterium and 40 MHz/T for fluorine. EPR has a much higher gamma, approximately 28 GHz/T. The heart of an NMR magnetometer is simply a coil wrapped around a sample material. The coil provides the RF energy needed to induce spin flips in the sample. It turns out that the best response is obtained if the axis of the coil is perpendicular to the field. The resolution is limited only by the resonance width, which, depending on the sample material, can be very narrow indeed, on the order of 1 Hz. In addition, NMR always measures total field strength, rather than a single component. Last but not least, since the gyromagnetic ratio is constant, the NMR magnetometer has practically no drift and requires no calibration. There are two fundamental methods of detecting the Nuclear Magnetic Resonance. The continuous-wave approach is like tuning a radio: we slowly adjust the frequency until we “tune in” the resonance. To be able to detect it, we must cross and re-cross the resonance, which means we must modulate either the frequency or the magnetic field. The pulsed-wave approach, on the other hand, is like ringing a bell: we strike the sample with a broad-band pulse, and the sample absorbs and reradiates at the Larmor frequency. The pulsed mode approach requires modern. fast-switching electronics, but it is more straightforward and generally delivers greater precision. After a resonance, the sample is usually allowed to shed the absorbed energy and regain its original, spin-aligned state. 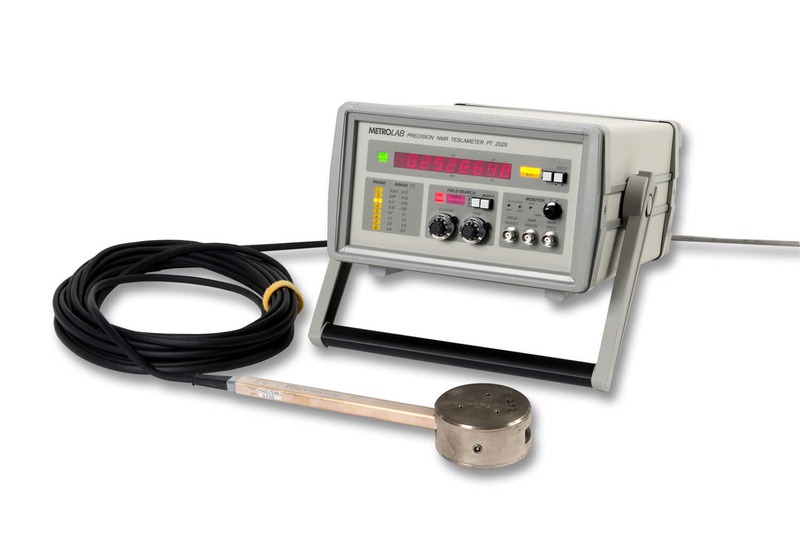 This limits the measurement rate to around 10-100 Hz. In addition, to reduce the variability, many such measurements are often averaged together, yielding effective measurement rates approaching a second. Therefore, NMR is usually only useful for slowly changing fields. If the field is not uniform, one edge of the sample will resonate at a different frequency from the other edge. The resonance peak broadens and flattens, until it completely disappears in the noise. This determines the field homogeneity limit of NMR. There are also practical limitations to the useful range of NMR. For low fields, the nuclei are only weakly aligned and the NMR response fades. The simplest solution is to use a larger sample, thereby increasing the number of participating spins; however, at a certain point the sample size becomes impractically large for a general-purpose probe. For high fields, the NMR response is excellent, but the instrument’s RF generator and the coil inductance impose an upper bound on attainable frequencies. To reduce the inductance, the size and number of turns of the coil are reduced, but a practical limit has been reached when the coil has been reduced to a single tiny loop. The coil around the sample is an inductor, with a response that rolls off at high frequencies. If we add a capacitance in parallel, we create an LC resonator, which, if tuned to coincide with the Larmor frequency, greatly improves the sensitivity of the NMR signal detection. For this reason, NMR probes are usually tuned. Tuning can be accomplished with a fixed capacitor and/or trim cap. In this case, the probe is manually tuned for a given frequency – as is the case, for example, for Metrolab’s Magnetic Field Camera. For our Precision Teslameter, we want a single probe to cover as large a range as possible, and we tune with an electronically controlled varicap. 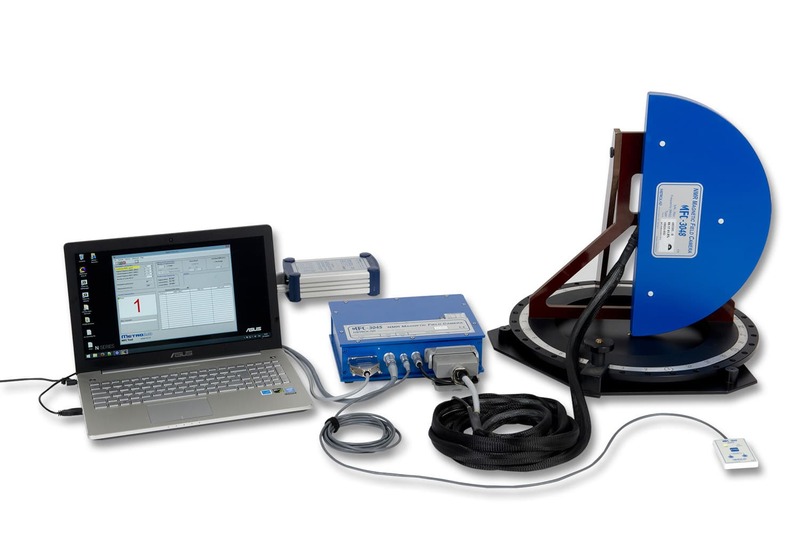 The dynamic range of the varicap imposes a practical limit to the measurement range of a single probe. To extend the measurement range of NMR, we can use a sample with a different gamma. For example, a deuterium sample has a gamma that is a factor 6.5 lower than the proton’s, so the same frequency range will measure fields 6.5x higher. Conversely, an ESR sample, with a gamma 2.5 orders of magnitude greater than the proton’s, will measure fields 2.5 orders of magnitude lower. Unfortunately, both these sample materials have practical drawbacks compared to ordinary proton samples.